Purpose: Use this document as a reference to generate accounting entries for online application fee payments in ctcLink. Select or enter a Business Unit. Select the Journal Template SF/GL. Select Transaction Date value of Current. Click OK on the on the process scheduler request page. 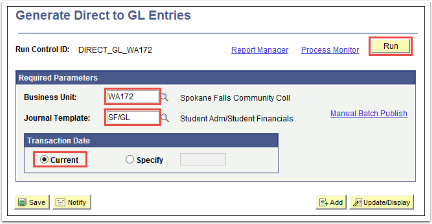 The Journal Template value may change for the Generate Direct to GL Entires process. 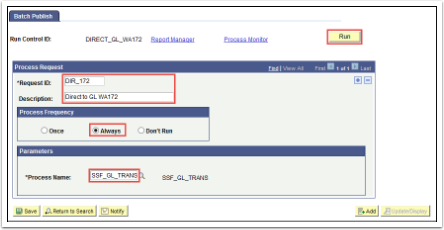 From the Generate Direct to GL Entries run control page, click on Manual Batch Publish. Enter a unique Request ID. Select Process Frequency of Always. Select or enter a Process Name of SSF_GL_TRANS.